Exploration is a mode. It can be switched on anywhere and at any time, and that is the beauty of it. It does not need to be in foreign territory to thrive, nor does it need to be activated when you are doing something totally alien. For our ‘mini-moon’ me and Mr Yolk (Alex) took a five day trip to the Algarve. I’d been there three or four times before. Mainly as an underage teenager. Portugal’s legal drinking age is 16 and so as a Putney teenager my school friends and I joined the London masses to descend on the Algarve’s plushest filthy dancing spot: Vale do Lobo. 7-10 days of thinking that anyone who bought you a WKD was prince charming and changing your name to Sky for the summer. Vale do Lobo was a complex designed to keep you in. Manicured, all-encompassing and with a handful of things on its menu. Beach, golf club, food, booze. Hardly worthy of sympathy, but hardly representative of the Algarve either. As with many resorts, it could have been anywhere. But the Algarve is a rugged, wild terrain. Rich with craftspeople, innovators, farmers, artists and paths not yet walked. It is a land with a rich Arabic history, having been under the North African moors for 500 years and it is a place with much more to give. Portugal is not shy of creative output. Lisbon is having a massive boom at the moment and if you look hard enough you’ll see that this spirit permeates the Algarve too. Our journey began at Casa Mae. As Instagram heroes go this one is WELL up there. I dare you not to want to transport yourself there after five seconds of scrolling. And so after about a year of lusting on the internet I did what any self-respecting explorer does, I booked a plane ticket. 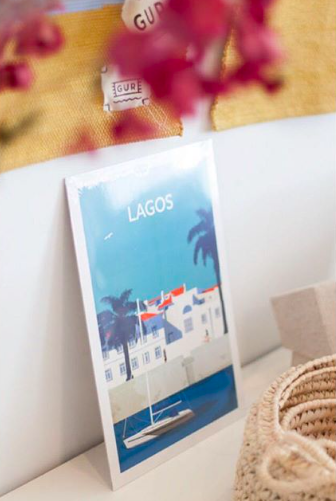 Casa Mae is an anomaly in relatively touristy Lagos. Grown from one white casa, it now has three buildings all forming the complete Casa Mae spirit. The ultimate in experience destinations, this one has creative workshops, cooking classes (including getting to know the onsite vegetable patch), yoga classes and massage engrained within its DNA. We met the most brilliant yoga teacher. An Algarve native called Sofia, who had recently returned from her time as a dancer in Brussels. Her mission returning to the Algarve was to help stimulate its cultural scene. Weaving dance and arts residences in with yoga and eco projects. She helped my husband find who I call ‘Eco Alex’. The new, zen Alex who practises yoga every day and is calm and conscious of his breathing. She was a godsend. Food at Casa Mae is good - and the people warm. 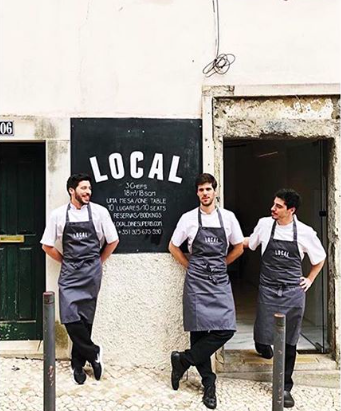 Locally sourced and homegrown is not so much of a trendy gimmick at Casa Mae but a way of life, as we would come to find throughout our time in the Algarve. Green veg is a source of pride and joy here, in fact one of the chefs proudly professes to us that his passion is vegetables. The breakfast menu is heavy in kale, spinach and avocado, but positioned alongside the classic pastel de nata, so as not to make you feel as as though this place is a health farm. The simple and frankly obvious approach to eco wellness doesn’t stop in the breakfast room. Plastic is nowhere to be found in the bathrooms. 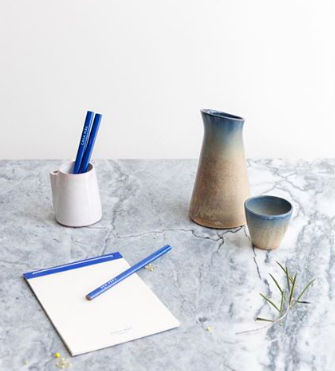 Bath oils and shampoos are made on site and cased in lush AF ceramics. It made me wonder why any hotel has little plastic shampoo bottles in their bathrooms at all. Especially (as I would find later at our final hotel, mini shampoo bottles from London based Molton Brown) - felt a bit odd in comparison. Music is hugely considered as is design. The Casa Mae playlist plays on loop in the bedrooms (don’t worry you can turn it off if you are the scrooge of Portuguese jams), but for us it became the soundtrack of our stay. So did the bright, happy design we found on the walls and in the ‘Loja’ - or shop. Colourful wall hangings and those elegant ceramics were for sale, as well as Portuguese made watches and prints of the local area. Yes I bought a ton. But as is the point of this article, our stay was not to be confined within the (frankly, brilliant) walls of Casa Mae. The local Algarve has much to offer. Nearby Sagres was first up on our list. Known for its sunsets and famous beer, we did both. A small surfer town about 15 minute drive from Casa Mae, this place is in stark contrast to populated, tourist spot, Lagos. Consisting of a small strip of only a handful of shops and restaurants, the attraction here is the landscape. The Algarve we came to explore, was recognised not by its stuff - but in fact by its lack of stuff. Open ocean, beach, rocks and surf. Vast spaces for walking and clear thinking, and one of the best sunsets in the world according to The Telegraph. Drive in to the centre, (you can’t miss it), park up and stroll. Find an uncrowded spot on a cliff for circa 5.30pm and watch the sun go down. For food and drink afterwards, Mum’s is the best spot. The essence of absence is not something we’re familiar with in the UK. Busy is apparently power and side-hustling and exercising like you’re an athlete is basically commonplace at the moment. So the idea of fraternising with the ‘nothing’ felt like the exploration of something unfamiliar. I’d been planning a wedding for the past 10 months, launching Yolk Studios, Yolklore magazine and Manchester’s first wellness festival, Float. I needed some nothing. So I found myself some more. Praia de Bordeira, Aljezur. Largely desserted, sand dunes heavy, a couple of birds. I sprawled out and read a book. Portugal in November was not bikini weather, but it was enough to feel the sun fall on my face and the clarity that nature gives enter my bones. But I like any self-respecting urbanite, needed my nothing in bursts. Also it started raining. So we drove. Thirty minutes further west, still in Aljezur we found O Sargo. A fabulous place of warmth and wonder. Full of families, smiles, laughter, gorgeous simplicity. Dogs, kids and life. Fish freshly caught and food that arrived over an hour late. But I didn't care. Because when the ambience is right you don’t. I spilt oil on my trousers, but I didn’t care, because it was lovely. Yes that flacid word. But it was lovely. Down to earth, life-affirming lovely. We ate and then wandered the nearby beach. Unsurprisingly unbusy. We saw a place you could come back to for years. Somewhere your kids would make memories and somewhere that could feel like home. We explored the local town. Quiet, Moroccan-esque vibes. A few emerging ‘hip’ places. Arte Bianca, a cool pizza place with gluten free offerings, Mediterranean bistro, Gulli and some cute Moorish gift shops, but overall relatively ‘nothing’. A small handful of ‘somethings’ - meant that nature and a whole bunch of smiley faces were the stars of the show. A lack of fancy or boutique hotels in Aljezur means many don’t gravitate here, which has helped preserve its unexplored haven status. But for those of you who fancy a little fancy, Monchique’s thermal baths are only a 45 minute drive away. Winding your way into the mountains, rest your head at Monchique Resort & Spa, which describes itself as ‘the only resort in this undiscovered area of Portugal’. Probably true. The plushest place we came across in the rugged Algarve (it has a BIG pool) and also a stone’s throw from natural thermal spa at Villa Termal des Caldas. Monchique’s thermal alkaline waters are rich in bocarbonate and these guys do a mean thermal relaxation circuit at their spa. Put your feet up and do relaxation in the Western way. When you’re bored of being massaged and adored take a walk to the village of Caldas de Monchique where you can up close and personal with this ‘magical, healing’ water. We could have ventured deeper into the western coast of the Algarve for weeks. The simple way of life here is (ironically, maybe) a hotbed for creative thinking, and I had fallen in love with my new serene state of mind. If you have the time, travel with West Coast Adventures deeper into this tranquil territory. Just look at these faces. O Sargo smiley chefs. For us, we ventured back down towards the airport in Faro for a final night of relative luxury. Design Hotels did good with the Vila Monte Farmhouse. Jolting us back into the land of the living, this place is busy - much closer to the airport - but still with Portuguese charm and commitment to locally sourced food and experiences. From horseback riding to island hopping (sadly we couldn’t visit Ria Formosa but apparently it is splendid) to harvesting local salt and an afternoon grazing goats. Nearby Olhoa is much more gritty and authentic - (read hectic and smelly). It’s the Algarve’s largest fishing port and I felt it had much more to give. If big hotels aren’t your thing but the Olhao area is on your radar, we flirted with staying at this gorgeous Medina, Convento Olhao, which perhaps would have ended our quiet retreat a bit better. Nevertheless as mini moons go this mini exploration was just the right volume. The Portuguese way of life is infectious in its approach. Simple, no-fuss, humble yet beautiful. Our exploration of the rugged West Algarve coast helped us find slower, more considered parts of ourselves that we didn’t know before. And as with all the best exploration, it left a permanent mark. I committed to find a passion for vegetables. (So far still working on that one). Alex pledged to do yoga every day (more or less - even if it is just for a few minutes) and most importantly I realised the luxury of ‘nothing’. No fancy shops, no cool bars, no people to impress (most of the other tourists and campervanning or nudists- not an underage teenager in sight), and you’re left with just sand, sea and rock, good, simple food and a cold beer. And everyone’s having a great time. And you realise, you don’t need a thing.